position, called the ANATOMICAL POSITION, is used as a point of reference. This anatomical position is assumed when the body stands erect, with arms hanging at the sides, and palms of the hands turned forward (fig. 3-2). Anterior or ventraltoward the front, or ventral (pertaining to the belly; abdomen), side of the body. Posterior or dorsaltoward the back, or dorsal, side of the body. Medialnear or toward the midline of the body. Lateralfarther away from the midline of the body. Proximalnearer the point of origin or closer to the body. Distalaway from the point of origin or away from the body. Caudaltoward the lower end of the body. 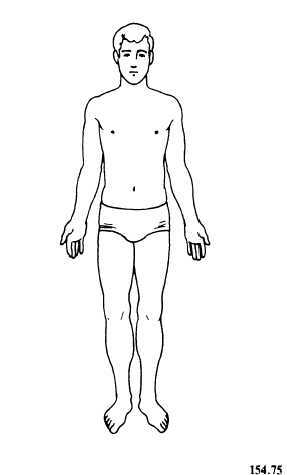 Erectnormal standing position of the body. Supinelying position of the body, face up. Pronelying position of the body, face down. Lateral recumbentlying position of the body on either side. PeripheralThe outward part or surface of a structure. All living things, animals and plants, are ORGANISMS that undergo chemical processes by which they sustain life and regenerate cells. The difference between them is that animals have sensations and the power of voluntary movement and require oxygen and organic food. Plants require only carbon dioxide and inorganic matter for food and have neither voluntary movement nor special sensory organs. In man, some of the characteristic functions necessary for survival include digestion, metabolism, and homeostasis. DIGESTION involves the physical and chemical breakdown of the food we eat into its simplest forms. METABOLISM is the process of absorption, storage, and use of these foods for body growth, maintenance, and repair. FIOMEOSTASIS is the bodys self-regulated control of its internal environment. It allows the organism to maintain a state of constancy or equilibrium, in spite of vast changes in the external environment. A typical cell is made up of the plasma membrane, a nucleus, and the cytoplasm.